Where the Pagets of Mayo came from is still a mystery. Paget is a name of French origin, first appearing in England at the time of William the Conqueror. A William Paget of humble origins later acquired vast estates from Henry the Eighth on the dissolution of the monasteries in the 1530s. Our Pagets could therefore have come from England, but Pagets were also among the French Huguenots who fled to Dublin to escape persecution, including a Thomas Paget (1). Walford states in 1860 that the Mayo Pagets had “settled in Ireland about the year 1630” (2). In 1690 there was a Captain Paget among the retinue of King James the Second in Ireland (3). Either way our own direct Paget ancestors may have lived in Dublin before purchasing properties in Mayo about early 18th century, where they lived as members of the Anglican Church of Ireland, and of the Anglo-Irish gentry. “Thomas Paget of Knockglass” (near Crossmolina, County Mayo) married Margaret Orme, daughter of Robert Orme of Carne sometime around 1740 (6). She was the great granddaughter of William Orme of Hanse Hall, Longdon, Staffordshire. The front section of the existing Knockglass House was probably built by 1776. The large rear wing (not visible in my photo below) was added sometime after 1840 as it wasn’t there when the maps were drawn for the Griffith’s Valuation. Thomas and Margaret had at least three children. In 1760 Margaret, “Eldest daughter of Thomas Paget of Knockglass” married Edward Orme of Ballycarroon (6), wording which implies that she had at least one younger sister. On 31 Oct 1776 “Thomas Pagett of Knockglass, Mayo” leased(?) “Lands of Beagh” to “Thomas Orme of Tully, Sligo” for the life of “Robert Pagett, second son of said Thomas Pagett”, in a deed witnessed by “James Pagett of Knockglass” (4). James must be the eldest son as he later inherited Knockglass House. He would have been aged 28 at the time he witnessed this deed. We don’t know what Thomas and Margaret looked like, but here’s a well-known image of some country gentry of the period who would have been their contemporaries (8). They probably dressed something like this at least. Thomas must have died by 1790, because on the 13th Jan 1791 James, aged 43, seems to be in control of the family funds, purchasing “Lands of Carrowgarrow” from Charles Atkinson, the deed witnessed by James’s cousin “Wm. Orme of Abbeytown” (7). His address is given as “James Paget of Dublin”, not Knockglass. It looks as though he had left Knockglass for a while, maybe tired of waiting to inherit, or was he in search of a wife? Meanwhile younger brother Robert had married his first cousin Catherine Orme, daughter of William Orme of Carne (2). A deed dated 3 Mar 1798 by “James Paget of Knockglass, Mayo, Gent.” is witnessed by “Robert Paget of Fahy, Esq.” (9), so Robert had already moved with his young family to Fahy House which had been built in 1796. North-East County Mayo was at the centre of the action during the Irish Rebellion of 1798 when in August, General Humbert’s French forces landed at Killala and captured Ballina. 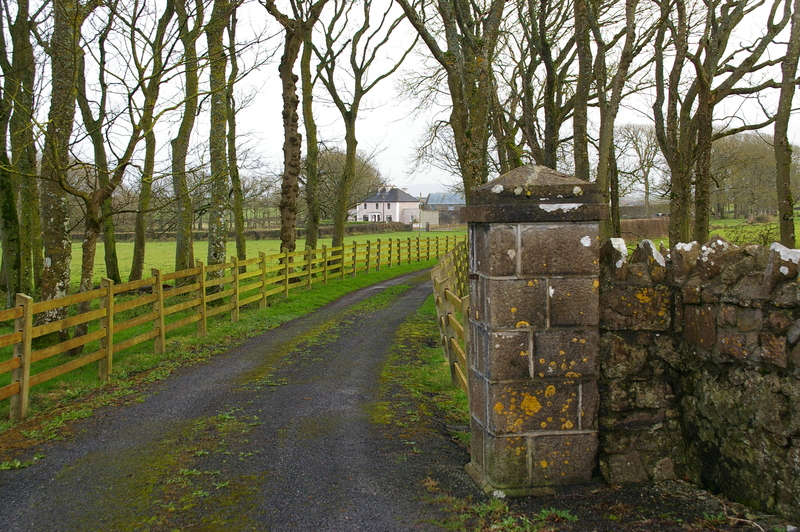 The French and their Irish rebel supporters would have marched right past Knockglass House on the way to their short-lived victory at The Battle of Castlebar. Our Pagets must have had a memorable few weeks. Afterwards “James Pagett Esq. of Knockglass” claimed and was allowed £856/10/8 for losses described as: “House, cattle, furniture, wine and cloaths”. “Robert Pagett of Fahy” claimed £1876/6/5. His losses were “Houses damaged, bark, cattle, spirits, utensils and leather”(25). 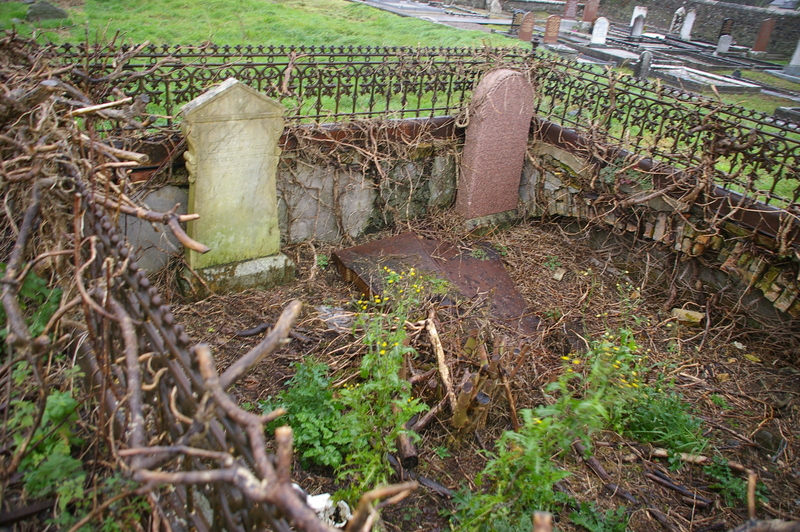 Margaret Paget’s husband, Edward Orme of Ballycarroon also made a claim (12). The other Paget claim was made by “Catherine Pagett, Knockglass, Mayo” who at the stated residence lost: “Linens, cloaths, jewellery and furniture” (25). She presumably isn’t Robert’s wife Catherine (who would have lived with her husband at Fahy) so might be a sister of Margaret, James and Robert as an earlier document had hinted, still unmarried. The parish register of their local church, St. Mary’s, Crossmolina commences on March 2nd 1802 with the note “NB The parish register prior to this was lost in the Rebellion of 1798” (5). 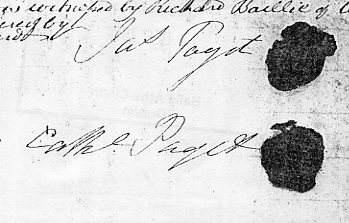 The first Paget entry in the register is the marriage of “Bridget Paget of Fahy” to “Thomas Reynolds of Mullenmore” on 21 Sept 1802. Over the following 20 years the births of 10 children of theirs are recorded. Her first name is unexpected and she must be 10 years older than her nearest recorded sibling, but it’s hard to account for her other than as the daughter of Robert Paget of Fahy. 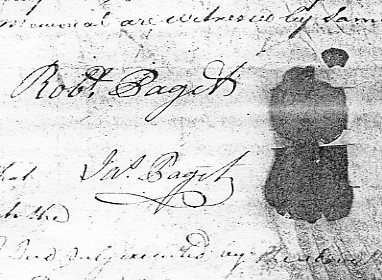 It was recorded 12 Jan 1815 that “Elizabeth Paget of Fahy” married “John Bourke of Ballina, Esq.”, and 19 Jun 1816 that “Thomas Paget of Fahy” married “Margaret Paget of Knockglass” – another marriage between first cousins. Their only known sibling, “Robert, son of Robert and Catherine Paget of Fahy, baptised 16 May 1802”, is the “Robert Paget Junior of Fahy” who died 26 Sept 1827 “age 25”. The family of James Paget of Knockglass is harder to work out. According to the parish register, Margaret Cummins (or Commens) is the mother of at least two of his seven known children. Is she the mother of all seven? The wording in the register is unusual “Baptism: Sarah, d. of James Paget, Esq. & Margart. Commens of Knockglass, 2 Oct 1804” and “John, son of James Paget & Margt Cummins of Knockglass 26 Feb 1809”. The home of both parents is given as Knockglass, but why is Margaret’s surname given when normally only the first name of the mother is listed? Surely they were married as their daughters married very respectably and their eldest daughter was also named Margaret. 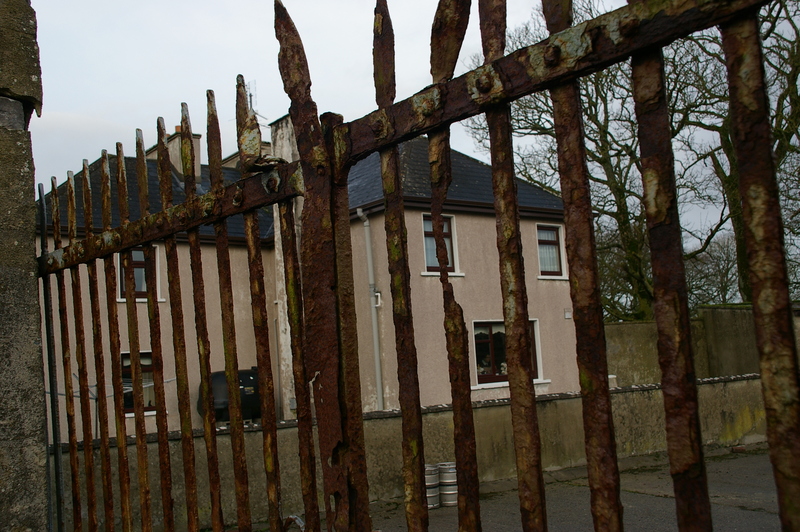 Their probable marriage predates the surviving Crossmolina parish records, as does the birth of their eldest children. Where did Margaret Cummins come from? Is the name of their son Henry a clue? There was a Henry Cummins Esq. living in Leinster St., Dublin in 1837 (10), and James Paget had lived in Dublin. James Paget was aged 50 when his eldest known child was born in 1798. He seems to have been a very conscientious parent. Most of what is known of his children comes from the marriage settlements and other deeds which ensured that each would be well provided for. Strangely though, his eldest son did not inherit Knockglass. Instead, it was deeded to his eldest daughter Margaret Paget and her husband (and first cousin) “Thomas Paget of Fahy, eldest son of the said Robert Paget”. Was their 1816 marriage a strategy to consolidate the family estates? James Paget was to have Knockglass and other lands for life, Robert was to have Fahy and other lands for life, each was to pay Thomas £100 per year in the meantime, and the young marrieds were to live with Robert and Catharine at Fahy (11). James did make provision for his sons though. In 1810 he paid £4,050 for the lands of Kinard and Lackancahill at nearby Enniscrone, County Sligo (14). James evidently had at least three sons. John, whose baptism is noted above, doesn’t appear in the records again so possibly died young. The confirmation of his older brothers “Henry and James Paget”, presumably close together in age, took place at St. Mary’s Crossmolina on Sept 17 1817 (5). “Henry Paget of Knockglass” was aged “about 12” in 1816 (12), but also disappeared from the record. Apparently the only son to reach adulthood was “James Paget the Younger of Knockglass, Mayo” who, aged 21, witnessed the 1824 marriage settlement between his younger sister “Elizabeth Paget, now the eldest unmarried daughter of the said James Paget of Knockglass” and “James Anderson the Younger, only son of James Anderson, both of Massbrook called Wood Park, Mayo” (13) In 1822 his sister Sarah had married “Robert Atkinson of Ballina, Surgeon and Apothecary”, and 17 Mar 1832 his youngest sister, Marcella Paget, married her cousin Edward Orme, JP and like her great-aunt Margaret before her, went to live at Ballycarroon (6). James Paget senior of Knockglass died on 6 Jan 1826 aged 77 (5), and his nephew Thomas Paget took over Knockglass House under the provisions of the earlier deed. Sadly Thomas’s wife Margaret (James’s daughter) had died four years earlier aged only 23, just a few days after the birth of their second son Thomas, 27 Jul 1821 (5). Their eldest son James (later Captain James Paget) would have been six when he, his widowed father and younger brother moved into Knockglass House. In 1828 Thomas married again, to Anne Emily Handy. Two little girls were born in the early 1830s but only Anne Jane lived to adulthood. Thomas’s father Robert Paget of Fahy died in 1834. His will left his remaining possessions to his daughter Elizabeth Bourke. After this Fahy ceased to be a Paget residence. 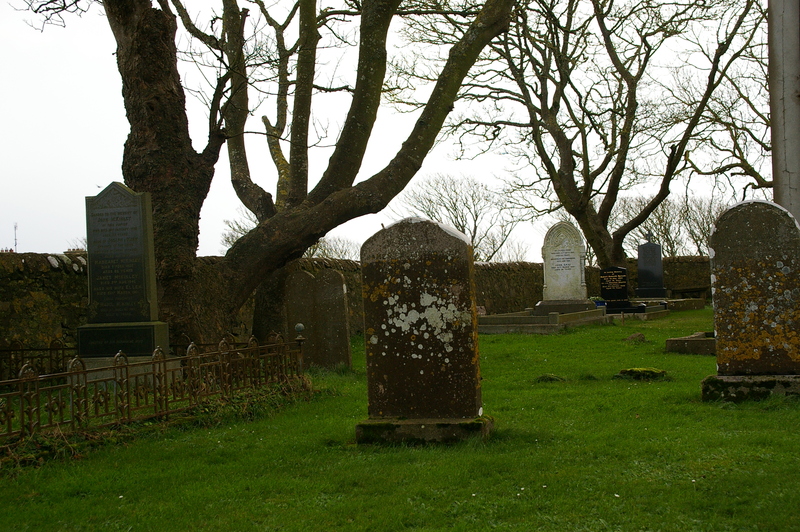 James Paget senior’s will has not survived, but his only surviving son James evidently inherited, among other lands, Kinard (also spelled Kinnard, Kinaird and Kineard) and Lackancahill near Enniscrone, County Sligo. In 1829, three years after his father’s death, James married Catherine Benson, the only daughter of Charles Benson, a Dublin barrister. Her dowry very likely helped him to build Kinard Lodge in the early 1830s. Many thanks to the current owner for permitting me to take these photos. Kinard Lodge. 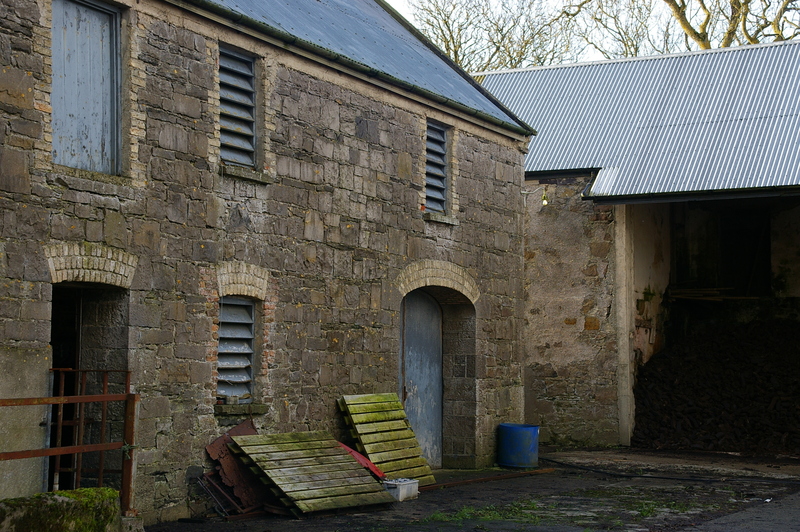 The pile of peat in the building on the right is used to heat the house. Thomas Paget, Esq., of Knockglass mentioned in the Board-room of this Union on Saturday an instance connected with the potato disease which may be interesting to know. This gentleman planted as an experiment a few potatoes which were partially affected with the blight among sound seed. The result was that when the stalks became large they exhibited all the appearance of the disease and so infected those in their immediate vicinity, but to prevent any further injury Mr. Paget had them removed. The famine was accompanied by major outbreaks of typhoid and cholera. One of the victims of cholera in 1849 was Walter, the 22 year old son of Elizabeth Paget and John Bourke of Ballina (17). Another was James Anderson Esq., either the husband or father-in-law of Elizabeth Paget, sister of James Paget of Kinard (19). 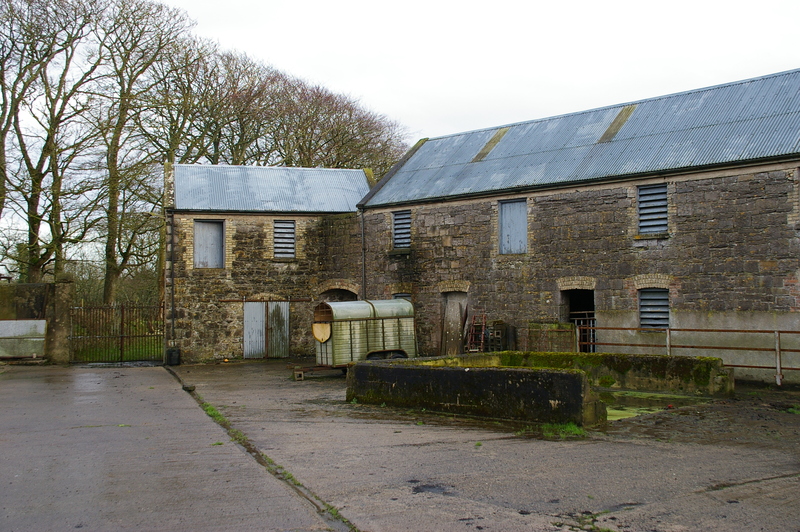 Although most of the gentry including the Pagets appeared to escape relatively unscathed, the loss of rental revenue in the aftermath of the famine was a major contributor to serious financial difficulties which many later experienced (18). Bitter memories of the famine also fed the subsequent drive for Irish independence from Britain (16). Thus in 1853 the Pagets were forced to sell the “Lands and mountain of Glendavoolagh” to Mr. Charles Warde for £1,250 in order to pay off encumbrances . On Friday 7th December 1855 their lands of Cullins, parts of Corbegano, Mullawns and Raheens were sold at public auction (20). Both James and Thomas Paget managed to hang on to most of their estates but James’s brother-in law Edward Orme was forced to sell Ballycarroon at the Encumbered Estates Court in the 1850s and he and wife Marcella moved to Belfast (12). James and Catherine Paget of Kinard seem to have been childless. In a Deed of April 1849 after 20 years of marriage, Catherine Paget appears, in affectionate terms, to be relinquishing her annuities from, and any further claim to the property of her husband James, she being “otherwise sufficiently provided for” (21). Between 1852 and 1862 James (our great great grandfather) had five children with our gg grandmother Hannah Dempsey. I can find no evidence that Catherine had died and you could not remarry with a living spouse in those days. There is no marriage on record for James and Hannah in the Irish marriage register, although from 1845 all protestant marriages were required to to be registered and those records (unlike many others in Ireland) have survived intact. In Dec 1866 James, by then father of five including three boys, sold his last properties in County Mayo, the lands of Belcong and Derryvicneill, with clauses protecting the new owner “in the event of the said James Paget having any heirs male of his body lawfully begotten” (22). James’s will left “Hannah Dempsy” as his sole executrix. Where Hannah came from is still a mystery except that her father was a John Dempsey. There was a tenant of that name on James’s land at Belcong (or Ballycong), but there were many Dempseys in the area, mostly Catholic families. James and Hannah’s three eldest children (baptised C of I under his name) were all born in Dublin, so it is possible that Hannah was from Dublin. Among the converts to the Church of Ireland in the previous century there had been various Dempseys, including a John and a Charles of Dublin (23). According to her death certificate (where, like all their children her surname is Paget) Hannah had also been married previously. I wonder if they just wanted a family of their own even though they were forbidden to marry under the law at the time. In 1872, James Paget, Gentleman, died at Kinard aged 69. His death certificate gives bronchitis as the cause. The story of Hannah and their children will continue in the next chapter. In 1857 there was a “criminal investigation” launched against Thomas Paget by Mr. John Knox of Greenwood, county Mayo. Both were magistrates at the Petty Sessions court at Crossmolina. Apparently on 5 August 1857, in the middle of a case hearing, Thomas Paget jumped out of his seat, clenching his fists at Mr Knox and shouting “You are a scoundrel and a ruffian, and were it not for the respect I have for the bench, I would break every bone in your body, you villain, you robber, you swindling scoundrel; you robbed me of my son, you scoundrel; you are unfit to sit upon that bench, you ruffian”. Apparently “he stamped, frothed at the mouth” and had to be dragged from the court! Mr. Knox later stated that his wife and Paget’s wife were sisters and that “James Paget, his son by a former marriage and who is now about 28 years of age and a Captain in the North Mayo Militia, of which regiment deponent is Major, was on the 5th August engaged to be married to deponent’s daughter, contrary to the wishes of said Thomas Paget and that the marriage subsequently took place… that the deponent’s conduct in consenting to the marriage was blameless as he believed an attachment existed between James Paget and his daughter” (24). As a result of this outburst Thomas Paget was called upon to resign his commission of the peace. Captain James Paget and Jane Caroline Knox were indeed married in Dublin, 19 August 1857. However their eldest child had been baptised three months earlier (5). This might account for both John Knox’s anxiety to further the marriage and Thomas Paget’s objection to it, but did he really expect his only son (who was actually 38 at the time) to abandon the young woman under the circumstances? Evidently it was a while before Thomas got over his resentment, as the first three children of Captain James and Jane Caroline were all born at the Knox’s home, Greenwood, not at Knockglass (5). Thomas’s daughter Anne Jane from his second marriage in turn married Capt. the Hon Algernon Thomas Moreton in Dec 1857, but both of their two children died at Knockglass in 1861 (5). They subsequently moved to Dublin. By 1863 Captain James and Jane Caroline must have been forgiven since their next three children were born at Knockglass (5), and sometime during the following ten years, Thomas and his wife moved to Dublin leaving Knockglass to the next generation. The lifestyle of the family at this period is indicated by a series of photos taken at the neighbouring property of Glenmore in the late 1880s. One of the subjects is a Miss Paget. If she’s the one with the tennis racquet I wonder if that’s how they really dressed for tennis back then! Captain James and Jane Caroline had six children but both their sons died young. 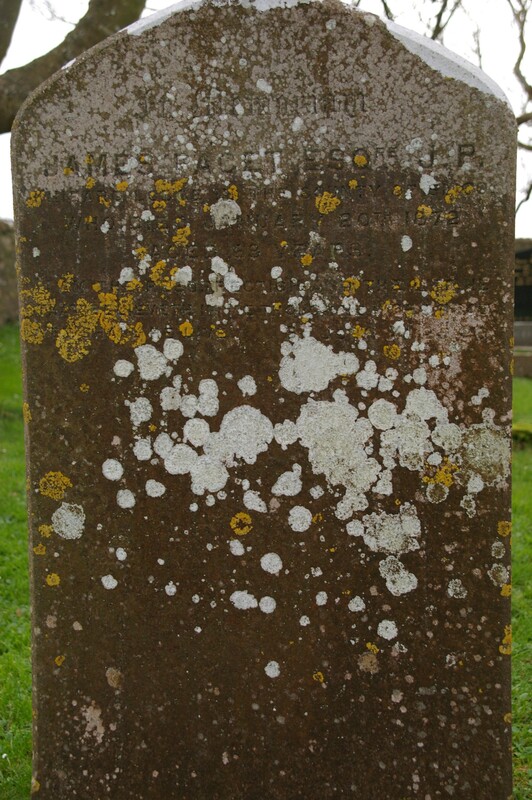 The death of the second in 1890, Thomas Cecil Paget aged 25, is recorded on the same tombstone as his parents at St. Mary’s Crossmolina. Of their four daughters, two married. Caroline Knox Paget married Henry Julian Richards in 1893. Their son John Henry Paget Richards is last heard of in America in 1937 aged 39. Annie Paget married Thomas Robert Henderson but I haven’t found out how they fared. Violet went to England to work as a nurse at an Infirmary for Children in Liverpool and apparently died single. Captain James died at Knockglass in 1901 followed in 1906 by his wife Jane Caroline. Their eldest daughter Jane lived there apparently alone except for servants until her death in 1930, the last of her family and Knockglass passed into other hands. 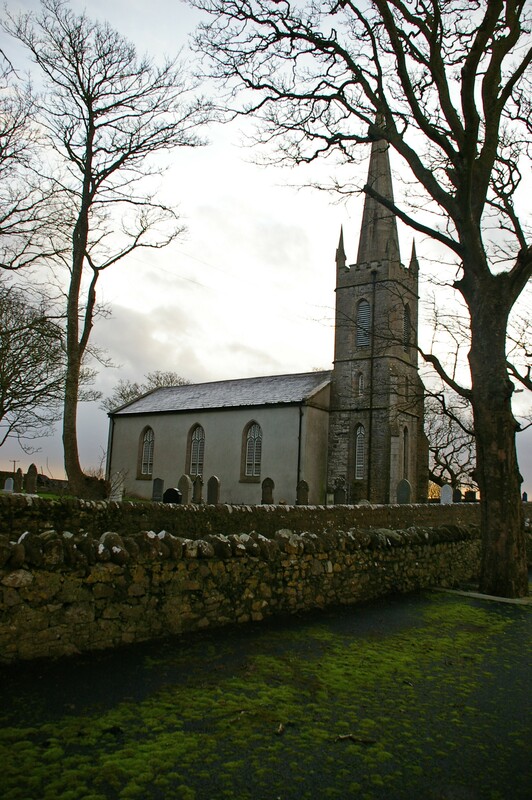 St. Mary’s C of I church, Crossmolina, scene of many Paget baptisms, weddings and burials. 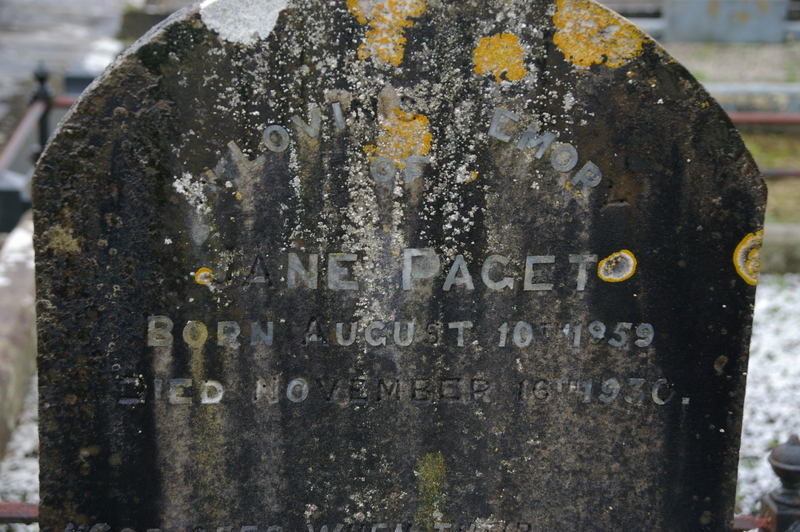 Tombstone of Jane Paget at St. Mary’s Crossmolina, who died in 1930, the last of the Pagets of Knockglass. The story of the Pagets of Mayo isn’t quite quite over yet though. It continues as part of the Beatty story in the next chapter. Raymond Hylton “Ireland’s Hugenots and their refuge, 1662-1745 : an unlikely haven”, 2005, pg. 132. John O’Hart “Irish landed gentry when Cromwell came to Ireland”, 1887. Deed 324-419-217323, Registry of Deeds, Dublin. Parish register of St. Mary’s Church, Crossmolina, county Mayo. “Burke’s Landed Gentry of Great Britian and Ireland” 1871 ed. Deed 449-17-287232, Registry of Deeds, Dublin. Deed 516-46-336139, Registry of Deeds, Dublin. Lewis Topographical Dictionary of Ireland 1837. Deed 726-104-495639, Registry of Deeds, Dublin. Tony Donohoe “History of Crossmolina”, 2003, p. 164, 525, 526. Deed 793-29-535765, Registry of Deeds, Dublin. Deed 625-42-427072, Registry of Deeds, Dublin. Document brought from Ireland by Marcella Beatty (nee Paget) in 1877 quoted by Janet Godfrey (nee McTaggart) in June 1983. Robert Kee “Ireland : a history” Rev ed. 1995, Chap. 5. Ballina Chronicle, 5 Sep 1849. John C. McTernan “The rise and fall of County Sligo landowning families” in “Irish roots” 2011, no.2. Ballina Chronicle, 20 June 1849. Freeman’s journal, Weds July 13 1853 and Mon Oct 1 1855. Deed 1849-18-235, Registry of Deeds, Dublin. Deed 1867-1-98, Registry of Deeds, Dublin. Convert rolls. Pages of book photographed at Nat. Archives, Dublin. Forgot to get citation! Deed 169-116-112988, Registry of Deeds, Dublin. Whew!!! An exhilirating gallop through the Paget family history. There are still some Pagets in Ireland, including some Robert Pagets, a name which recurs several times in the Mayo Pagets. It is also a frequently occurring name combination in historical records for Pagets in England and Wales going back at least to the sixteenth century. My mother, who was born in Kinnard and is a gg-granddaughter of Elizabeth Paget and John Bourke,maintains that our Paget ancestors came from Wales and Shropshire. Hi Helen, Yes maybe a bit too exhilarating! I might try adding a chart to clarify. I certainly didn’t mean to imply that there aren’t still many Pagets in Ireland – just no descendants of the first Thomas of Knockglass with Paget as surname. I’ll rewrite to clarify. The Pagets could well have come from Wales and/or Shropshire Does your mother have any Paget documents? No documents in my mother’s possession, but records show that she has been fairly accurate in what she has passed on from her grandfather, who was born in 1870 and was the grandson of Elizabeth Paget. Elizabeth used her connections to one of the two Paget viceroys in Ireland to obtain good army commissions for several of her sons, presumably around 1840. This would seem to point to British origins. Elizabeth’s son, Colonel Oliver Paget Bourke, became Exon to Queen Victoria, and held the post for about fourteen years. This was a position in which a high ranking officer was exempted from regimental duties in order to act as the commanding officer for the Royal Lifeguards, as the various Guards regiments took the role in turn. Did you come across the fact that Sir William Paget was given the manor of Langdon/Longdon in Staffordshire, where William Orme of Hanch Hall also lived and may have paid him rent, in the era of Henry VIII? There are also mentions of two later Orme and Paget men from the same locality, who served as soldiers, and clearly were friends, in the late 18th century. There seems to be a long history of Paget/Orme connections, but it is frustratingly difficult to find out whether the Longdon Pagets were connected to the Crossmolina family. 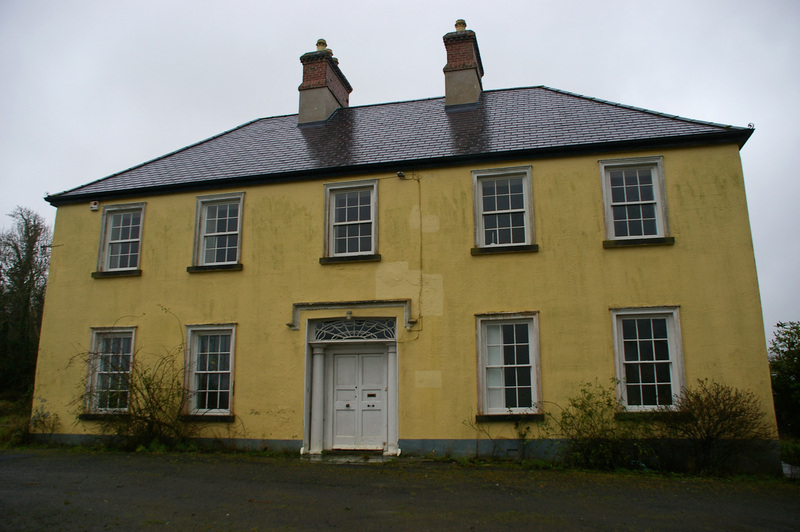 I am researching my husband’s ‘Rowe’ ancestors from Crossmolina, and I understand that a Patrick Rowe owned Knockglass House at some stage between the Paget Family and when it became the Bishop’s Palace. Does anyone know how and when Patrick Rowe got Knockglass House, and maybe any information on his relatives so I can see if he is connected to the Rowes I am researching? I know my husband’s great grand-uncle Michael Rowe was killed outside the gates of Knockglass House and there is a shrine on the wall to commemorate this. Thanks for commenting. The name Rowe does sound familiar but all I can say for sure is that a Paget lived in the house until 1930 when she died. The documents for the sale or transfer are probably on record at the appropriate agency in Dublin though. Hi Tina, I lived in Knockglass , my parents worked for the Church of Ireland, and we lived in a cottage beside the Bishops Palace. Indeed there were Rowes living in Knockglass . My father often mentioned them. Paddy Rowe springs to mind. I will ask my mother who may have dates etc. She is now 84 so should be fairly accurate. Patrick Rowe is mentioned along with a few sources. Just reading through these interesting articles, my name is Robert Paget my father is also Robert, as was my grandfather. I have been trying to find out about a Tom Paget who’s name appears on some trophy’s in the Wishing Well Pub in Blackrock Dublin Ireland. He went to school in the 1960’s in Blackrock.I have not been able to find out anything about what they for or where he is or if he is related to my family. My Grandfather died in Leopardstown Park hospital in the 1960’s, he had a pension from the British Army which transferred to my Grandmother till she died in 2000.My Father who will be 80 years old in April this year is the eldest of the family,does not know who the trophy’s belong to or if he is related. Hi Robert. My dads name is Robert Paget as was my Grandfather and his dad. My great grandfather was born in donneybrook around 1886. He married Kate Rowlin and had my grandad in summerhill in 1911, my grandad married eileen o’brien and had my dad in 1943. Does any of this sound familiar? There were Pagets in Dublin (including one or more Thomas Pagets) in the late 18th and 19th century who could have been your ancestors, and I haven’t found out yet whether they were related to the Pagets of Mayo. You probably are not a descendant of the Mayo Pagets though as I’m pretty sure the Paget name in that line died out. A possible exception could be my great grand uncle William, born about 1862 and evidently still alive at the the end of the century according to his mother’s death certificate, but who didn’t come to Australia with the others. I would dearly love to find out what happened to him. 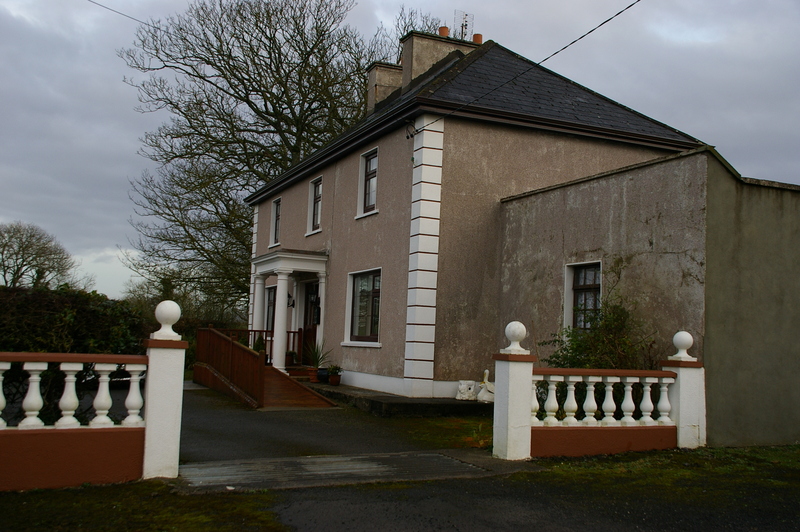 Harold Fellowes Prynne who was at one time Diocesan Architect for Tuam Diocese, owned Knockglass House and lived there from 1951 until 1963 when he sold the property to the Representative Church Body. You may be able to find out who sold it to him now you have this information. Thanks Lady B, If Tina checks back this might help her to work out where her Rowe ancestor fitted in. I have been advised that my g-g-grandfather Thomas Bourke who came to Canada in 1839 at the age of 18 may have been a child of John Bourke and Elizabeth Paget (1796-1886). Do you have any information on the children of John and Elizabeth that might confirm this suggested connection? Robert and Elizabeth certainly had a lot of children. My best source on them is Deed 1849-2-147 at the Registry of Deeds in Dublin which lists them by name. There is no Thomas on the list and it would be hard to fit another child in. On the other hand it’s possible that a son who had emigrated 10 years previously might have been omitted from the list. I didn’t record the exact wording. I’ll put you in touch with Bourke descendants who might know more. Having just spoken to my dad he told my grandfather was born in ringsend Dublin in 1913.He does not know when his father was born but his name was also Robert. But he does insist the family came from France. How this might help I do not know.I myself have just made contact with a Robert Paget in Nevada USA.I will be asking him where his family came from and will let you know more . Not sure if you are the same Robert Paget whom I remember meeting in Blackrock about 25 years ago. Perhaps you could email me (hmgbiz@gmail.com). The Robert Paget name has so many tantalising leads, but it seems very difficult to unravel the 17th century Pagets in Ireland. I’m pleased and proud to hear from you Brendan. I’m aware of your work, and at one stage was going to get in touch with you about a couple of Orme details. I think we pretty much agree about the points where the Pagets and Ormes intersect and I think you’re right that there were two unrelated Orme families in Mayo at the time. I’m travelling in Europe at the moment and my mind is not on family research. I might contact you in a few weeks though. Good morning to all. James Garry Paget here. I only discovered your wonderful website this morning as I researched a “Paget story” that we had relatives who came from Ireland. I have to run but I shall return. Hi Garry, Thanks for commenting. I guess you realise that there were a lot of Pagets in Ireland that weren’t from Mayo – many in Dublin for example. It would be good if we were related though. Enjoy your researching! Hi Wendy Jane, It’s quite possible that the Pagets went to Mayo from Dublin in the late 18th century. If somebody felt like trawling carefully through dozens more Paget deeds at the registry of Deeds in Dublin the evidence could emerge. It’s also possible that they came from England. I had a quick look at the Paget family there at the time but couldn’t find a link. Are you in touch with the Robert Paget who commented above? I can put you in touch if not. My grandfather was Wilfred Paget (spelt “Padget”). His father was Richard Paget, and his grandfather was George Paget who was born in Ireland c.1805. George was one of the first Irish settlers in Victoria County, Ontario, Canada settling in the area in 1821; although according to some sources (historical atlases), he was in the area before that time. He was illiterate, but he was a yeoman, so he had some money. He married Fanny Taylor, who was also born in Ireland. They had 11 children (the last died in infancy), and many Padgets (alt. Padgett, Pagett) are still living in the Victoria County (Ontario, Canada) area today. A James Paget, who I assume to be George’s brother or a close relative, also settled in the area in the late 1820s. He married Anne Jackson, who was born in Ireland; they had at least six children and also lived in Victoria County. 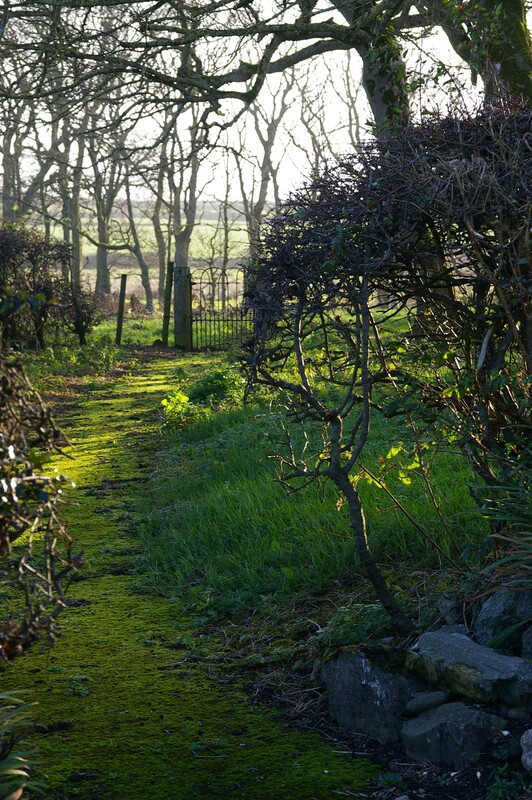 When I visited Ireland a couple of years ago, I found “Paget Avenue” in Enniskillen, Co. Fermanagh. According to Canadian history books on Irish emigration, a large group of Irish Protestants came to Upper Canada in the early nineteen century from Counties Cavan and Fermanagh. The Robinson immigration, a few years later, brought poor Irish Catholics to the same area. I can’t find the name Paget among them, but I do find the name “Pigott” and derivatives. The only connection I’ve been able to make back to Ireland in the Canadian immigration records (IRISH EMIGRANTS IN NORTH AMERICA, Part I, 24), is a listing for a John Paget who travelled from Ireland to Canada in 1819 with his wife, son, and three daughters on the brig “Jane”. I’ve got no other details. Can anyone contribute to these details? I have just started getting into genealogy, but at this point have no hope of getting to Ireland, so have been doing as much as possible on line, and came across this information on the Paget/Bourke’s quite by accident while trying to find out information on my great grandmother, Kate Bourke. I have been unable to locate any information about who her parents were. I do not know if she was a “Catherine”, as the family always called her Kate. She was born in 1857 or thereabouts, married Henry Simpson and had 14 children, one of whom is my grandmother. They lived on a farm called Whitefield in Sligo and according to my uncle, now deceased, they lived near the residence of Kate’s parents whose home was called the Paget-Bourke house. The picture I have of that house looks very similar to the picture you have posted of Kinard Lodge with the quoins, white brick around the bottom, double chimneys, etc. My uncle didn’t know why it was called the Paget-Bourke house. Apparently, when my ggrandmother married Henry Simpson, he was Church of Ireland and the Bourkes were Catholic so her family was not happy with her. I was presuming that Oliver Bourke married to Bridget/Belinda was possibly Kate’s brother, but in the Beatty family information Oliver was listed with one brother and no sisters. 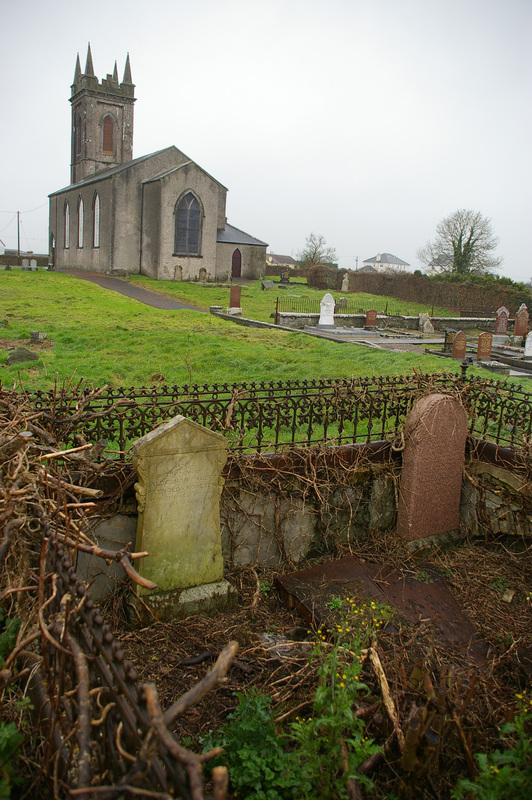 Kate and Henry are buried in Kilglass, he died in 1919 and she in 1930. Is it possible I have found my gggrandparents? Kate Simpson (née Bourke) was the daughter of James Paget Bourke and Maria Daly. Her father was Church of Ireland, and there was no rift on the grounds of religion – there was a very close connection all through her married life between her family in Whitefield and her parents (and subsequently her brother, Oliver, who was my great-grandfather) next door in Kinnard House. My email is helengalla@gmail.com, if you would like to get in touch. I was interested to read the blog about Irish Pagets. I have a Paget in my Irish tree that I have been unable to find anything about. Rhoda Paget married Jonathan Ravell presumably sometime before the birth of their first child in Dublin in 1823. Between 1823 and 1838 they had 8 children born in Dublin – John, Anna, Rhoda, Mary, Joseph, Sarah, Moses and Anne (my great grandmother). Jonathan Ravell died in Dublin in 1875 and he was a widower, so Rhoda died sometime between 1838 and 1875. As I said I have had no luck researching Rhoda Paget – any help, advice, pointers would be much appreciated. I have only studied the Pagets of Mayo. There were many Pagets in Dublin. If they owned property I’d suggest the Registry of Deeds as a source of information. There are many deeds as yet unindexed for various Pagets of Dublin. Thanks for reminding me of the Registry of Deeds. Plenty are indexed and also on FamilySearch. Going through them should keep me off the streets and out of trouble for a good while !! Irish research is a test of ingenuity and perserverance is it not? Perseverence and ingenuity for sure 🙂 You might find that the indexed Paget deeds are mostly those that I indexed for the Mayo Pagets during my research. All the Memorials of Deeds are now online though, scratchy old writing, abstruse legalese and all. Can be very rewarding. My great,great grandmother was a Miss Elisabeth Orme Of Ballycarroon House.She married Richard Ussher Roberts of Waterford.He died in1875 in Sligo and she died in 1921.I wonder where they are buried.Apparently he died a bankrupt.Looks like the Orme,s had lost their money as well.I know of a portrait of Edward Orme of Ballycarroon. Hi. My grandfather born 1875,worked in knockglass house all his life.from your research Caroline paget married Henry Julian Richards, They resided in Barnagh housebetween belmullet and blacksod on ely bay west mayo. Their son John Henry Paget Richards signed his name as JHP Richards, but was known as Harry ? he was in Ypres in Belgium in1919 with the army..He was in Carolina U S A in 1922He went to USA to get married or after getting married..When captain james wife died in1906 ,their daughter Caroline Richards returned to live in knockglass with her daughter Muriel around 1907.The other daughter Vera stayed mostly in barnagh house as she was very sick. And the sea air helped?.Vera died young about 30 yrs.the father is not mentioned ,had he died or left?. They all sent post cards to Vera.l have some of the cards. 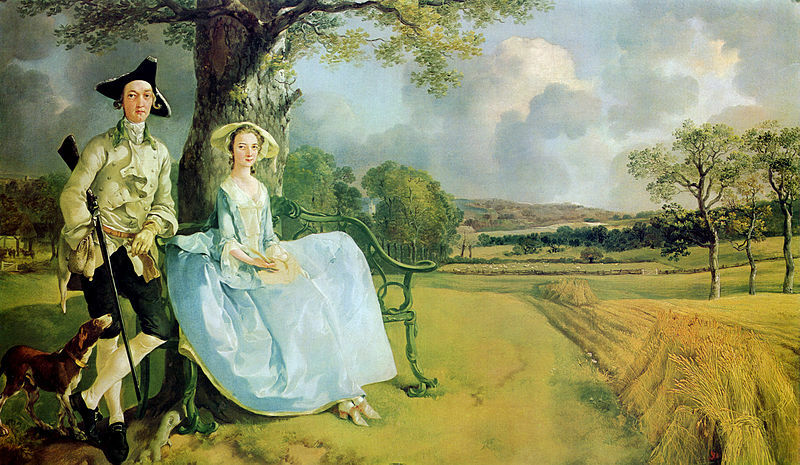 Miss Muriel went to England when her mother Caroline died. Muriel wrote to my grandmother .Last letter was in 1972 .she was living alone but her brother was back living in England in Bexhill on sea 70 miles from her withnis wife. Hope this will help add another small piece to the puzzle. Thanks T.m. that’s really interesting!